Square Enix has plans for the 25th anniversary of the SaGa series that will take place in December 2014. Akitoshi Kawazu, creator of the SaGa series and producer at Square Enix, said this in an interview with 4gamer.net. The first game in the SaGa series, Makai Toushi SaGa (known as The Final Fantasy Legend outside Japan) was released back on 15 December 1989 on Game Boy and got two sequels. 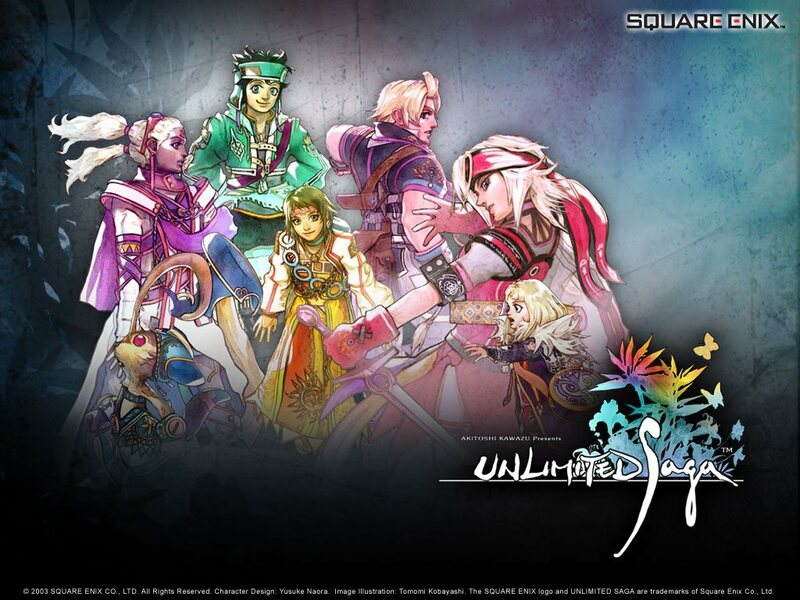 Later Romancing SaGa 1, 2 & 3 were released on Super Nintendo, SaGa Frontier 1 & 2 on PlayStation and Unlimited Saga on PlayStation 2. More details about Square Enix's plans were not revealed by Kawazu. Hopefully a new game in the SaGa series will be announced. I want to wish everybody a Merry Christmas and a Happy 2014! When I look back at the year 2013 it was the year that Square Enix released a lot of remakes. Final Fantasy IV, The After Years and Final Fantasy V for mobile devices and also new games like Final Fantasy All The Bravest (don't look at that game, it's crap). Kingdom Hearts 1.5 HD ReMIX was released and Final Fantasy VIII got a digital re-release. In August Final Fantasy XIV: A Realm Reborn was worldwide launched (after the original version flopped), which had a bad start with servers that couldn't handle the amount of players. It was also the year that Final Fantasy XV (first known as Final Fantasy Versus XIII) and Kingdom Hearts III where finally announced for the next generation consoles. Also, as expected, Kingdom Hearts 2.5 HD ReMIX was recently announced. What will 2014 bring us? Lightning Returns: Final Fantasy XIII will be up first. The third game in the Lightning-saga will hit stores in February. The HD version of Final Fantasy X and Final Fantasy X-2 will be released in March (Japan will get them in 2 days). Other games that will be released are Drakengard 3 and Kingdom Hearts 2.5 HD ReMIX. A couple of days ago the Jump Festa took place in Japan (which is an annual exposition showing new anime, manga and also games). During the event a new trailer has been revealed of Kingdom Hearts HD 2.5 ReMIX showing in-game footage of the 3 games (Kingdom Hearts II, Kingdom Hearts: Birth By Sleep and Kingdom Hearts Re:coded (cinematics only) that are included in this HD version. Kingdom Hearts HD 2.5 ReMIX is stated for a release somewhere next year. Final Fantasy XIV Patch 2.1: A Realm Awoken now live! Today the first major patch of Final Fantasy XIV: A Realm Reborn has gone live! Version 2.1, named A Realm Awoken, introduces large-scale additions and refinements made to Eorzea. Square Enix has provided a 10 minute long video introducing area's like the Crystal Tower (for an alliance of 24 players), PvP Arena, a housing system for free companies and rebalanced job actions. For more details regarding the version 2.1 patch check out this article on the Lodestone. You can also check out the special website. Final Fantasy VIII digital download now available! Square Enix has announced that as of today Final Fantasy VIII is available for download on the Square Enix Store and Steam. Like the re-release of Final Fantasy VII, this version has been enhanced for modern PC's and has some new features like cloud saving, a magic booster and 45 Steam achievements. Like the original PC version, which was released back in 2000 by Eidos, Chocobo World is also available. Final Fantasy VIII is available for $ 11,99 / € 12,99 on the Square Enix Store (NA / EU) and Steam. PlayStation 4 released in Europe! North America already got the PlayStation 4 on 15 November and Sony sold 1 Million consoles in 24 hours and last Friday us Europeans can also get Sony's new console! Some gameshops were open at midnight for lucky gamers who preordered the console months ago, since it has already been sold out. The MediaMarkt in Germany didn't really do that and it was first come first served as you can see in the below video.